Below are some more stretches that you might like to incorporate when warming down or stretching out specific muscles to improve your range of movement. Remember: Never force a stretch. Go to the point of tension and hold for the required amount of time. For Safety ensure knee and feet alignment and avoid "locking" elbows or knees straight. 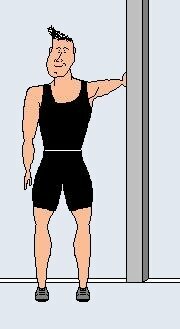 We have animated some of the stretches - they take up to 10 seconds to go between positions to emphasis the need to hold a stretch. Stand with feet shoulder width apart. Keeping your body upright tilt your head to the side whilst keeping the rest of your body stationary. Hold before returning to the upright position and repeating on the other side. Stand with feet shoulder width apart. Keeping your body upright roll your shoulders in an anti-clockwise direction, trying to create as large a circle as possible. Repeat this five times before changing direction and performing clockwise rotations. Stand with feet shoulder width apart. Keeping your body upright put the palm of your hand against a wall or other structure, so that it is behind you. Gently push you shoulder forwards to create the stretch. Repeat this with your other arm. With your hands by your side, palms down, lie on your back and lift your feet above your head. Then, if you find the first part too easy, try to get your feet to touch the ground behind your head. 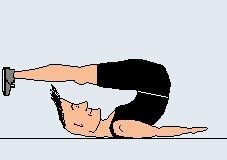 Lie on your back and lift your leg up towards your chest, holding your calf as demonstrated, until you feel the stretch in your hamstring. It is important that the leg is straight, but that you don't lock your knee. 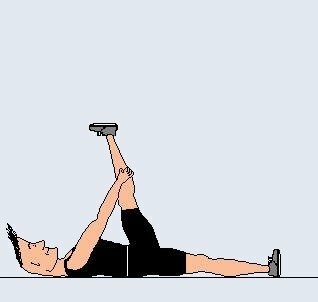 This stretch has a similar purpose to the hamstring stretch detailed with the warm up stretches, though some say that it is more effective as there is the ability to put as much stretch into the muscle as you like, and none of the other muscles in the area are tensed due the weight bearing during the exercise.